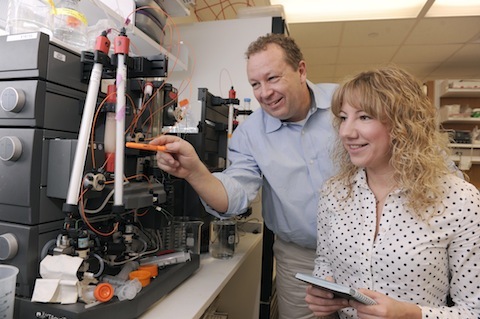 DALLAS – Researchers at UT Southwestern Medical Center have taken another step toward better understanding the metabolic functions of obesity and its connection to type 2 diabetes. Dr. Philipp Scherer, Director of the Touchstone Center for Diabetes Research at UT Southwestern, led a group of researchers in a recent multicenter study published in Nature Medicine that successfully identified ways to manipulate the protein mitoNEET. This is the first time the protein has been effectively altered to expand fat tissue in a way that allows subjects – in this case, mice – to remain metabolically healthy. MitoNEET is a key component of a cell’s mitochondrion, which serves as the cell’s energy powerhouse. When the levels of MitoNEET protein were elevated inside the fat cells of rodents, more fat was stored in the adipose tissue, thereby keeping toxic lipids away from other types of cells. This sequestration resulted in extremely obese yet metabolically healthy mice that displayed no signs of type 2 diabetes. In contrast, when MitoNEET levels were decreased, the mice became lean but unhealthy, and developed pre-diabetic conditions such as failure to metabolize glucose properly. “The manipulation of mitochondrial activity in fat tissue is a very powerful approach to control how much excess energy we store in our bodies and where we store it. We have heretofore underestimated the importance of mitochondrial pathways in our fat cells and their influence on how we manage our weight,” said Dr. Scherer, senior author of the three-year study and Professor of Internal Medicine and Cell Biology at UTSW. The body stores fat in the white adipose tissue, and, ideally, individuals burn any excess calories through exercise and a healthy diet. The current research findings suggest that manipulating components of mitochondria in fat cells can be an effective way to funnel excess calories into “good” locations. This storage then thwarts their negative effect on other internal organs like the liver in which excess fat accumulation is toxic. The obese mice in this study weighed 120 to 130 grams (4.23 to 4.58 ounces), whereas a normal adult mouse weighs 25 to 30 grams (.88 to 1.06 ounces). This difference is the equivalent of a 150-pound person increasing his or her weight to 700 pounds. The researchers were careful to clarify that the findings were not meant to encourage obesity, even though the obese mice were considered metabolically healthy. The study instead provides a clearer understanding of the mitochondrion’s importance to the metabolic dysfunction – that is characteristic of obese patients and those with type 2 diabetes. The researchers now hope to translate these findings into a clinical setting. The staff of the Touchstone Center is devoted to the study of cells and tissues that either contribute to or are affected by diabetes and related diseases, including the physiology of adipose tissue. Other UT Southwestern researchers involved in the study were Dr. William L. Holland, Instructor in Internal Medicine; Dr. Kai Sun, Assistant Instructor in Internal Medicine; Dr. Jiyoung Park, Assistant Instructor in Internal Medicine; and Stephen B. Spurgin, a medical student. Scientists from the Albert Einstein College of Medicine, the University of Utah School of Medicine, and Merck Research Laboratories also contributed. The investigation was funded by support from the National Institutes of Health, the American Heart Association, and fellowships from the Juvenile Diabetes Research Foundation and the Department of Defense.